For Irish Artist And Author Sara Baume, Words Are Anchored In Images "I see the world and then I describe it," says Sara Baume. 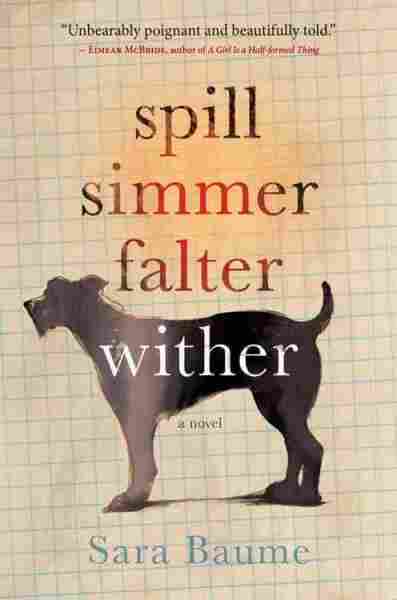 Her debut novel, Spill Simmer Falter Wither, is a "very atypical love story" between a troubled man and his adopted one-eyed dog. It took a little over a year for Sara Baume's debut novel — about a troubled man who adopts a one-eyed dog — to go from being accepted for publication to being published. "I made the clay dogs to keep the thing alive for myself after it was finished, but before it was a book," she writes on her blog. 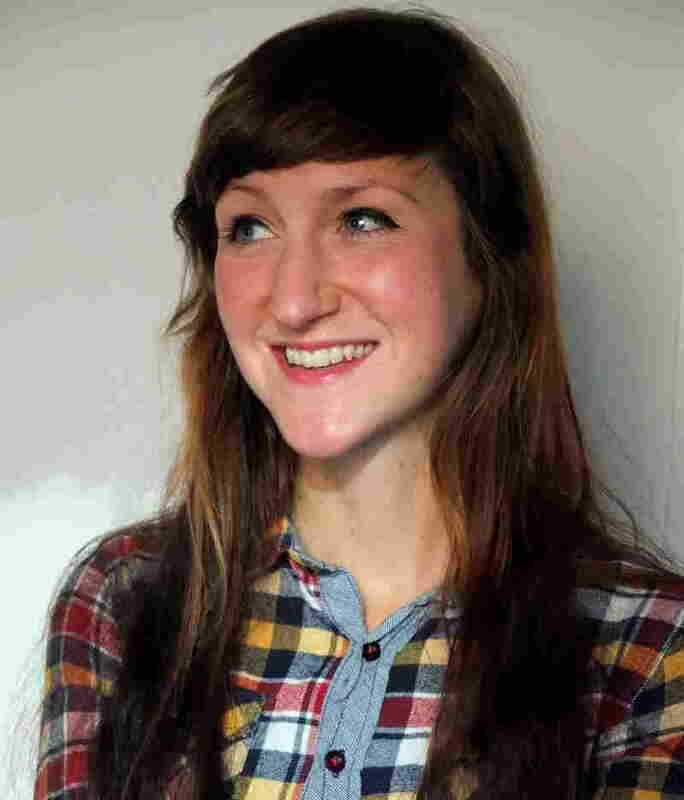 Before she was a writer, Sara Baume set out to be a visual artist. "First and foremost I see; I see the world and then I describe it ..." she says. 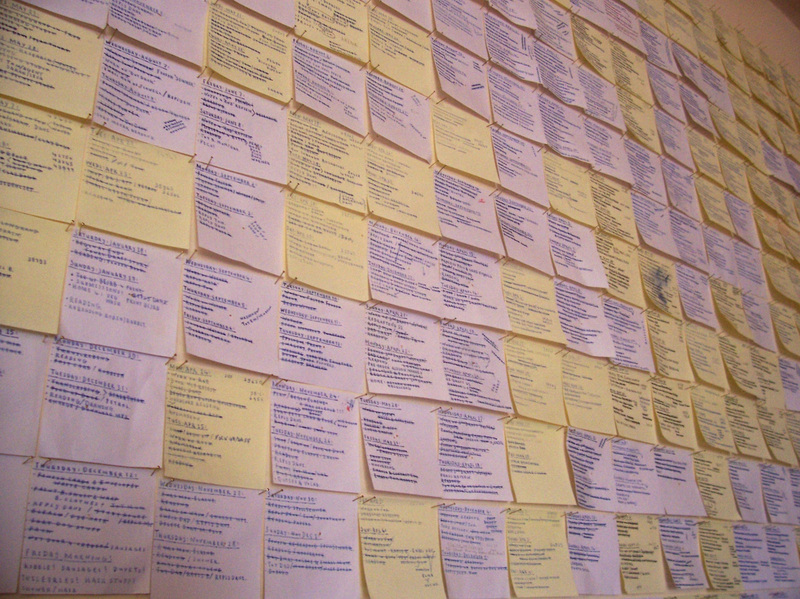 "I don't know another way to write. I always anchor everything in an image." 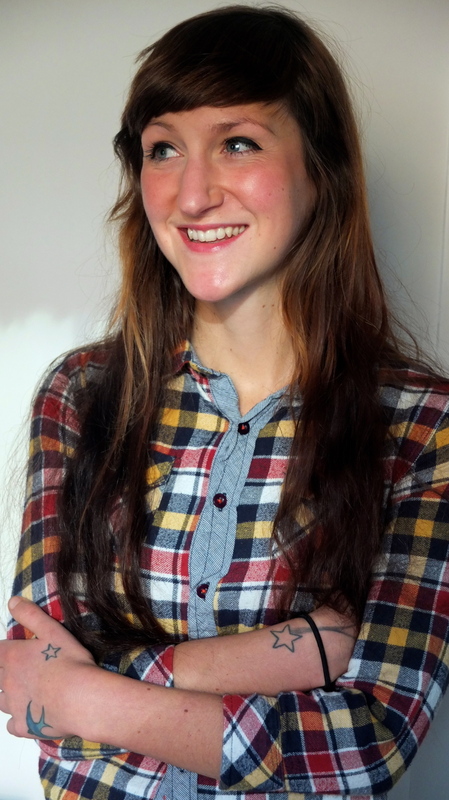 Sara Baume was the recipient of the 2014 Davy Byrnes Short Story Award and the 2015 Hennessy New Irish Writing Award. Spill Simmer Falter Wither is her first novel. Baume's process works — a review in The Irish Times called her debut novel a "stunning and wonderful achievement by a writer touched by greatness." Baume loves words, and she loves fitting words together so they flow like poetry. "I can hear in my head the way a sentence should sound," she explains. "It even has a number of different beats, so I'll end up adding words that aren't even fully necessary because in my head the rhythm of the sentence has to have an extra ba-dum, ba-dum at the end." Baume's debut novel, Spill Simmer Falter Wither is divided into four sections, each one a different season, with names she made up to reflect what her main character Ray is going through; spring becomes spill, simmer is summer, falter is fall, and wither, winter. Ray is a 57-year-old man who Baume describes as "too old for starting over, too young for giving up." He is a misfit who has lived an isolated life in a small Irish village by the sea. Baume wrote the book while living in a village very much like the one in her novel. "Rural Ireland is a wonderful place if you're at home there or accepted there, and if not, it can be difficult," Baume says. "I mean, Ray is an example of someone who's been in this village his whole life but he's strange, people perceive him to be strange and sort of steer clear of him." Throughout the book Ray talks to his dog, One Eye, releasing long bottled up feelings and sharing buried secrets. One Eye is a shelter dog with a difficult past, very much like the dog Baume adopted five year ago. "No one else wanted him ..." Baume says. "He's a troubled soul, he's aggressive. So I ended up adopting him, me and my boyfriend, but he came at a strange phase of life in which I sort of needed to save something. This dog came along and gave purpose to my life. And that was eventually how the book came about." Baume used Post-it notes to track two years of days — "all those upon which I wrote or tried to write, all the things I managed and didn't manage to cross off, all the little pieces of nothing I did in between." 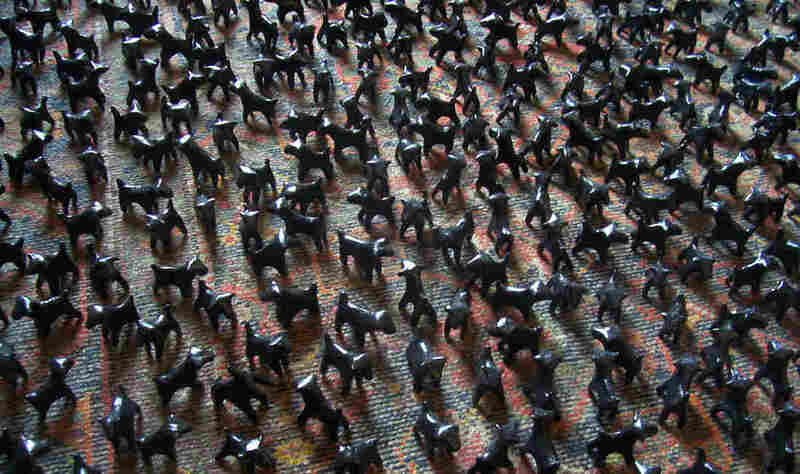 But Baume says this is not a book about a dog — in fact she never uses the word "dog" in the novel. This, she says, is Ray's story. One Eye adores his owner, but can turn unexpectedly vicious. After a couple of violent encounters, Ray fears the village will turn on them. To protect the dog he loves, Ray flees the village that has always been his home but has never shown him any affection. The man and his dog wander aimlessly, living in Ray's car and depleting his savings. In the end, Baume says, Ray is both liberated and destroyed by the dog. 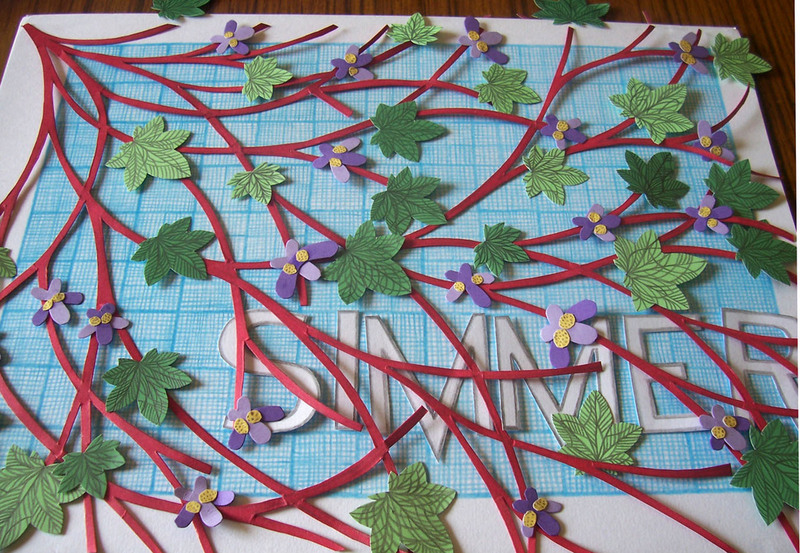 A Spill Simmer Falter Wither-inspired papercut. See more of Baume's artwork on her blog. "I suppose I wanted him to have chance at a relationship," Baume says. "And so I wanted him to have a relationship with something that just loved him utterly, irrespective, and that's what we all get from animals I think. But I thought he needed this chance to be liberated, and so it is, in that sense, a love story, but a very atypical love story." Baume is surprised by the success of her first novel. It's gotten wonderful reviews and been nominated for awards in Ireland and England. But such success can be both thrilling and chilling. As she starts in on her second novel, Baume says she feels more touched by fear than greatness. And as for that seaside village where she wrote Spill Simmer Falter Wither? She has moved on ... but she still has her dog.